I had few very ripe bananas sitting in the fruit bowl. The only way I can think of to use them up is cake. I want something light and less calorie rich. I had banana chiffon before, it's a bit bland IMO. Then I thought why not add coconut with banana for a change. Can't use coconut milk on top of the pureed banana or the cake will be too wet. Then I thought why not add coconut cream powder then I can have the coconut flavour without compromising the wetness of the cake. So this recipe was what I concocted and it worked. The cake was light and much more flavourful than banana alone. Chiffon cake is a South East Asian Cake similar to American Angel Cake. 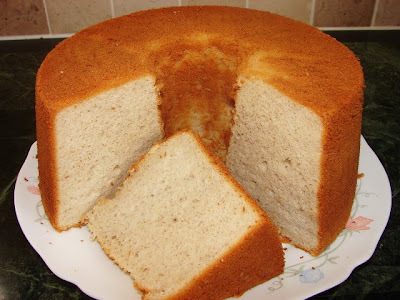 Difference between angel cake and chiffon cake is angel cake use all egg whites and chiffon cake use whole eggs. Chiffon cake has two parts one is the whipped egg whites and the other is a batter mixture. Both Angel and Chiffon are baked using a tube tin/pan. There are few do and don't when making chiffon cakes. Always use a tube tin/pan with a loosen tube and the tin/pan must not have any non stick coating. Do not grease the tin/pan. Do not open the oven door during baking. No peeping at all or the cake will collapse. Do set the timer to remind you when to take the cake out. Soon as you take the cake out you have to invert it, so the cake is hang upside down. Do let the cake cool completely before you take it out of the tin/pan. Scrape the cake out using a long thin knife. For more details how to make this type of cakes see previous posts, orange chiffon and pandan chiffon. 200g self raising flour (if using plain flour or all purpose, sieve the flour with 1/2 tsp of baking powder). In a clean large bowl, whip the egg whites and cream of tartar till frothy and light then slowly add in the sugar a little at a time while continue whisking. Whisk till egg white is stiff. Test is to invert the bowl and egg white will not drop out. Add about 1/4 of the whipped egg white into the batter mixture, fold and mix. Then add the remaining egg white into the batter mixture, fold till well mixed. Take the cake out and invert it up side down, cooling on a rack so air can circulate and cool the cake at the same time. When the cake is completely cooled. Use a long thin knife, glide gently along the tin/pan inside ring and outside rim. Then push the cake out from the bottom of the pan/tin. Using the knife and glide gently along the base the of the cake. Now the cake is completely loosen. Put a plate on top of the cake, invert it and the cake will drop out and fall on the plate. I had this cake on its own because I don't want to pile up the calories. If you like a bit of frosting or icing, make a cream cheese frosting with added coconut cream powder will be nice with toasted coconut and few slices of banana as deco. If you don't have the same 23cm tin as mine, can use one slightly larger or smaller. For a smaller cake tin/pan, fill with the cake mixture and leave about 1" room for the cake to rise, discard any left over or make pancakes with the leftover. Gosh, please send me a slice. Your chiffon cake is just beautiful. I have to bookmark this recipe and try it someday. Thank you for the tips. i have tried several of your recipes and one particular one that i adore is your banana coconut chiffon. i have a qns, do you think i could sub the banana for pumpkin puree, perhaps lesser since pumpkin is wetter than banana and omit the coconut milk? Coconut in this recipe is in powder form so doesn't affect the liquid content. Pumpkin on its own can be bland also you need the coconut for the flavour and fat to keep the cake moist. What I would do is steamed twice the amount of pumpkin. Mashed if it is thick use as it, if it looks watery then and press it through a fine sieve (or wrap in muslin) to squeeze out some liquid, then measure and use the same amount as banana. Good luck hope it turns out ok.
thanks for such prompt reply!!! much appreciated. anyways, i tried it out twice, first time i used 300 gram pumpkin omitted but omitted the coconut milk, because my husband doesnt fancy coconut milk, everything else was the same. unfortunately, the cake fell out of the tin whilst it was cooling inverted!!!! : ( i was wondering if it be because i didnt increase the flour since i omitted the coconut milk powder? the second time around i tried it your way, increased the amount of pumpkin puree(i microwaved it instead of steaming because i figured that steaming it makes it more watery) and added the coconut milk powder. cake didnt fall out this time, it came out very nicely! overall, i actually thought that the first attempt without the coconutmilk powder was better, because like u said pumpkin in itself is pretty bland, so adding the coconut actually totally robbed away any pumpkin flavour. my qns now is what should i have done to prevent the cake from falling out? There may be two possibilities why the cake drop out of the tin. 2. there is too much moisture in the cake mixture. If you really want to try again without coconut powder, this may help but I am not too sure. 1. squeeze the pumpkin drier than before (best use muslin or cloth), then use only 250g. 3. Leave everything else the same leaving out the coconut powder. My all-time favorite cake! Thank you for sharing this easy to follow recipe with us. I would surely give your recipe a try as I have a party coming up and I want to serve this for dessert, this would definitely go well with a hot cup of coffee made from my coffee maker at home. Hope I can include this recipe in my espresso review site online. Kudos!